Please e-mail the library with your feedback. For more information on the American Antiquarian Society's newspaper collection, visit the newspapers page on the AAS website. 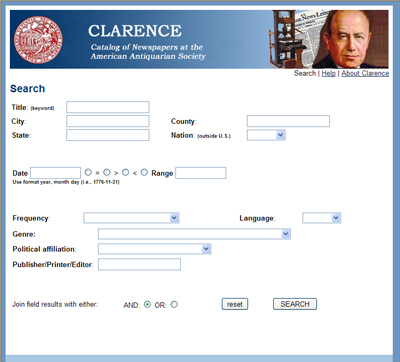 Clarence provides detailed information on the newspaper holdings of the American Antiquarian Society. Clarence identifies exactly which issues of newspapers are available at AAS. At this time Clarence contains records for around 80 per cent of the newspapers in the collection. Inputting the holdings data for the entire collection is ongoing. Most of the titles in the American Antiquarian Society's newspaper collection, however, have records in the online catalog. Though imprecise, holdings summaries are available for these titles. The search screen contains a combination of data entry boxes and pull-down menus. Join field results with "and" to narrow results, qualifying the search to contain all of each search terms. Join field results with "or" to widen results to records containing the results of all of the search terms. Each field is described in more detail below. Enter the complete title or keywords from the title. Enter the city or town in which the newspaper was published. Enter the county in which the newspaper was published. Select the state in which the newspaper was published from the pull-down menu. Select the nation outside of the U.S. in which the newspaper was published from the pull-down menu. The American Antiquarian Society's newspaper collection focuses on United States newspapers. However, newspapers from other nations are included. Use the pull-down menu to select a frequency of newspaper publication. Examples of the frequency include daily, monthly, and quarterly. Use the pull-down menu to select a language. Enter the name (keyword) of a publisher, printer, or editor. Select a genre term from the pull-down menu. View the complete list of the genre term definitions. Select a political affiliation from the pull-down menu. Many 18th and 19th century newspapers had an open political affiliation. Join field results with either "and" or "or"